Western blot analysis of extracts from UV treated HeLa cells, transfected with 100 nM SignalSilence® Control siRNA (Unconjugated) #6568 (-) or SignalSilence® ATR siRNA I (+), using Phospho-(Ser/Thr) ATM/ATR Substrate (4F7) Rabbit mAb #2909 (upper) or α-Tubulin (11H10) Rabbit mAb #2125 (lower). 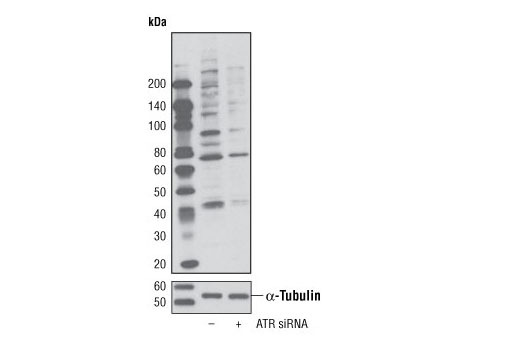 The Phospho-(Ser/Thr) ATM/ATR Substrate (4F7) Rabbit mAb confirms reduction of ATR kinase activity, while the α-Tubulin (11H10) Rabbit mAb is used as a loading control. Western blot analysis of extracts from HeLa cells, transfected with 100 nM SignalSilence® Control siRNA (Unconjugated) #6568 (-), SignalSilence® ATR siRNA I (+) or SignalSilence® ATR siRNA II #6289 (+), using ATR Antibody #2790 (upper) or α-Tubulin (11H10) Rabbit mAb #2125 (lower). 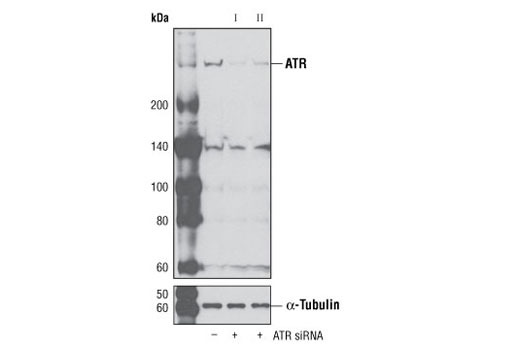 The ATR Antibody confirms silencing of ATR expression, while the α-Tubulin (11H10) Rabbit mAb is used as a loading control. CST recommends transfection with 100 nM ATR siRNA I 48 to 72 hours prior to cell lysis. For transfection procedure, follow protocol provided by the transfection reagent manufacturer. Please feel free to contact CST with any questions on use.